A bus collided with a truck in eastern Afghanistan, killing at least 51 people including children. 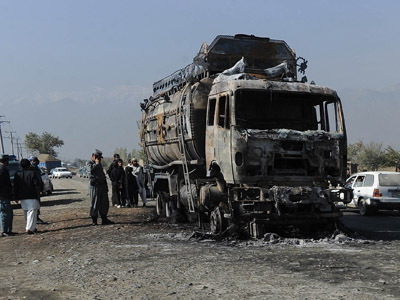 51 of the 56 passengers on the bus were confirmed dead, Ghazni Province Police Chief Gen. Zarawar Zahid said. Both vehicles were completely destroyed in the fire that resulted from the collision. Afghan police are currently attempting to pull crash victims from the wreckage. All of the dead were badly burned, and will be difficult to identify, Zahid said. The status of the vehicles’ drivers is unknown. Authorities have ruled out an attack as the cause of the crash, which has yet to be determined.